The blockbuster bestseller now in a manga edition--fully illustrated and fun to read! Beautifully illustrated by Kensuke Okabayashi, this enthralling edition of Patrick Lencioni's massive bestseller gives readers a new format in which to understand the fascinating, complex world of teams. Kathryn Petersen, Decision Tech's CEO, faces the ultimate leadership crisis: Uniting a team in such disarray that it threatens to bring down the entire company. Will she succeed? Will she be fired? Will the company fail? Lencioni's gripping tale serves as a timeless reminder that leadership requires as much courage as it does insight. 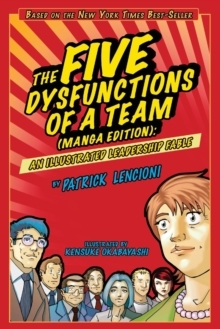 Throughout the story, Lencioni reveals the five dysfunctions that go to the heart of why teams--even the best ones--often struggle. He outlines a powerful model and actionable steps that can be used to overcome these common hurdles and build a cohesive, effective team. This is a compelling fable with a powerful, yet deceptively simple message for all those who strive to be exceptional leaders. Kensuke Okabayashi (Jersey City, NJ) is a working illustrator, a graduate of the School of Visual Arts, and an instructor at the Educational Alliance Art School in New York City.